Lieutenant Lacey Anderson of the Dallas Police Department heads up a elite new squad dedicated to solving crimes involving Immortals like herself. Lacey, a Vampire left for dead when her family was slaughtered by Werewolves, still has nightmares about the attack. Detective Colton Scarber is her unwilling partner and second-in-command. He’s a Werewolf, a descendant of those who killed Lacey’s coven. She’s unaware of this, but she doesn’t trust him from the start. 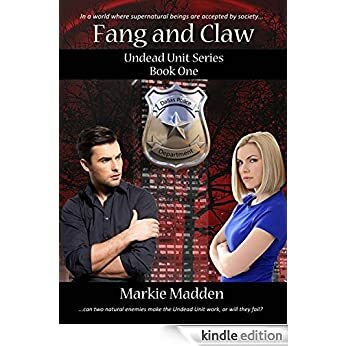 When the fragile beginning of the team is threatened by the truth, can they learn to trust one another as partners must, or will the Undead Unit be doomed to failure? A mysterious suspect and strange physical evidence leads them to solve a case spanning decades, and leaves Lacey with no other choice but to rely on her enemy when her very life is at stake! Growling low, the sound vibrating into my chest, I stood up as the wolves I had been searching for flared in my mind’s eye. There were a few dozen that could reach me soon if they started running toward me. They would do just that, they just needed the proper motivation. I reached into the depths of my being, tapping into all the fae power Kieran and Kayden’s blood had regaled me with, and used it to spread my scent farther across the lands I had single-handedly invaded. I used the wind to bring the trail to them. I could feel their fur bristling as their nostrils flared with the foreign scent. Snarls and growls followed, then piercing howls, calling to each other and beckoning their pack mates, spurring them on to give chase and come find me. I chuckled, knowing I’d finally accomplished my first task, getting the Siberian Killers to come to me. The rest would be much simpler. The enemy werewolves would only have to follow their ancient rules and kill every wolf that stepped foot on their territory. Rule breakers had to pay, and I had broken their one rule for foreigners. No better way to get yourself killed than getting ferocious killers all riled up. I took another step forward, adjusting my grip on my swords and rolling my shoulders. I then tilted my head left and right, hearing my bones crack and set in place. I could feel the cold ground and fading grass under my feet, the wind blowing my hair out of my eyes, and hear the sounds of birds and small game running away from the path of the oncoming wolves. They’d reach me within minutes and my muscles tensed, adrenalin spiking and making my blood roar with excitement at the fast approaching fight. I let my head fall back and howled, a long, deep sound that made the forest around me go quiet for about a minute. I knew my attackers had stopped in their tracks, raising their muzzles and sniffing the air. Disbelief was a strong ally in a grossly unmatched fight. I imagined they’d have a hard time understanding why a lone wolf who had just been caught on their territory would howl in challenge like that. I assumed the distance had also puzzled them. As they’d caught my scent, they had thought I’d be closer. Surprise, surprise! 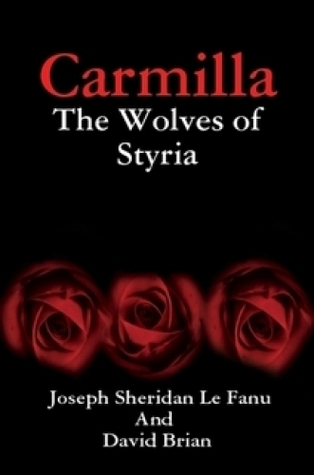 Today we’re featuring an exclusive extract from Carmilla: The Wolves of Styria, by David Brian. Have a read. We followed the cortège with our eyes, until it was swiftly lost to sight in the misty wood; and the very sound of the hoofs and the wheels died away in the silent night air. Our good Madame Perrodon answered tenderly, and added some comfortable assurances. Madame answered all her questions in so far as she understood them; and gradually the young lady remembered how the misadventure came about, and was glad to hear that no one in, or in attendance on the carriage was hurt; and on learning that her mamma had left her here, till her return in about three months, she wept. As soon as she is comfortably in bed, I thought, I will run up to her room and see her. My father in the meantime had instructed that a servant on horseback be sent for the physician, who lived about two leagues away; and also that a bedroom be prepared for the young lady’s reception. The stranger now rose, and leaning on Madame’s arm, walked slowly towards the drawbridge that led into the castle gate, our small group forming a cortege behind them. It was at this point, that for sure the evening’s strangest of happenings occurred. We were barely a stones throw from the drawbridge, when a sound, much like the distant rolling of thunder, signalled that once again something was approaching from the high ground. In unison, we turned, only to behold a sight the like of which I will never forget. Down from the hills, and running out onto the bridge, there appeared a wolf. Now I make no claim to having been an expert on such animals, indeed my previous experience consisted of only ever before having seen two of these most beguiling of creatures. They are rare in these parts now, and on both previous occasions it had been but the briefest of glimpses, viewed from some considerable distance. However, even allowing for my lack of knowledge of such beasts, I recognised the fact that this animal was huge, being easily big enough to have taken down a stallion, without assistance from other members of its pack. I opened my mouth to speak; I was both excited and alarmed at being in such close proximity to this fascinating and equally frightening creature. However, my silence was sustained by Mademoiselle De Lafontaine’s grip upon my forearm. A grip which grew suddenly tighter, as with her other hand she pointed back towards the hills. Our little group fell as silent as it had become still, not a one of us daring to move. We watched in awe, and I dare say no small amount of fear, as running down from the hilltops, under the light of a silver moon, there appeared six more wolves. They raced out onto the road, and then across the bridge, and although slightly smaller in stature than the first black beast, every one and all looked a most formidable creature. Within an instant they had passed, trailing off in the same direction as the carriage cortège had previously taken. It took us some moments before any of us actually found our voices, and then we broke into an excitable babble, each one of us seeking to offer our own explanation as to what could have possibly brought these animals this close to our home. sure that our young visitor did not partake of discussion about the beasts, at least not on that first night of her arrival at our schloss.